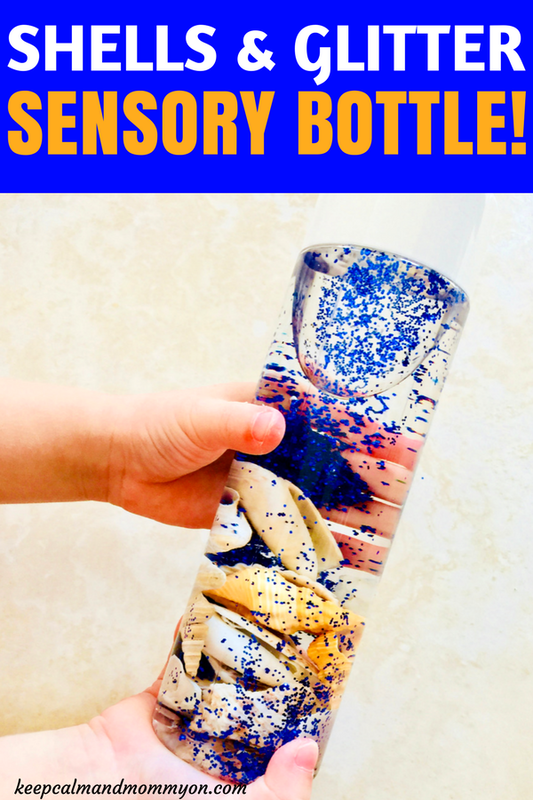 Are you looking for fun and stimulating sensory bottles to make for your child? 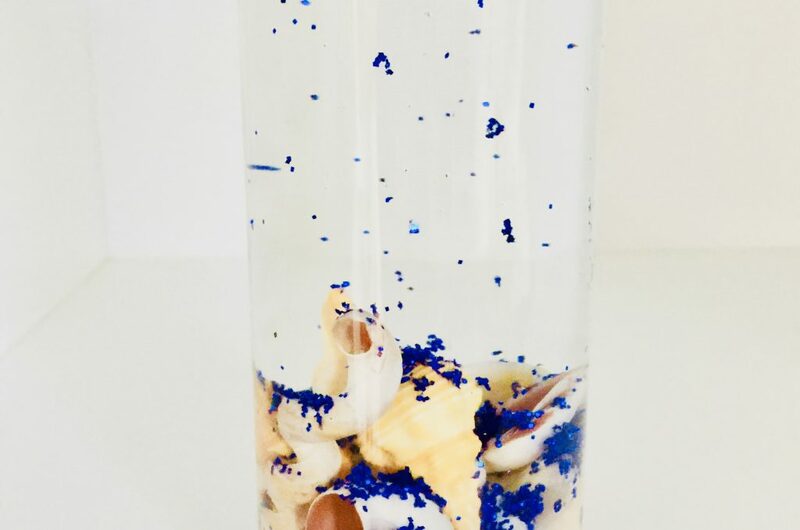 Shell and glitter sensory bottles are a great way to incorporate sensory stimulation into your child’s play! 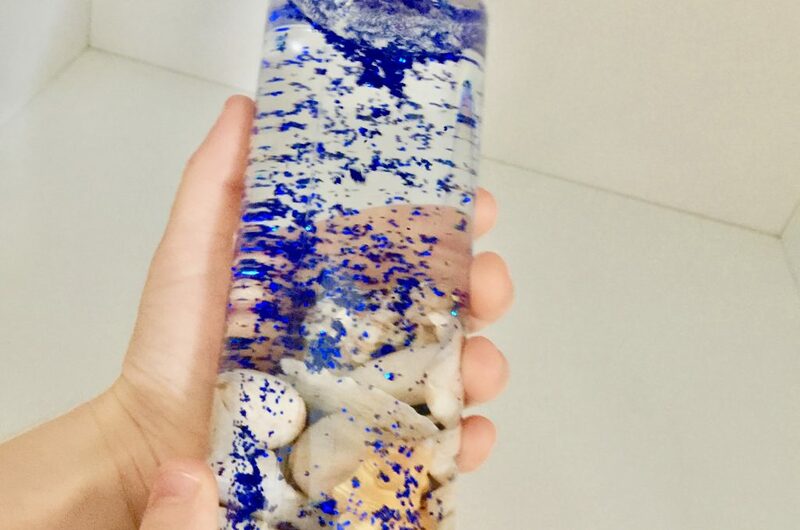 One of the first sensory bottles that we created was the shell and glitter sensory bottle! It’s one of my children’s favorites! The feel of the water and shells moving through the bottle is very soothing and calming. 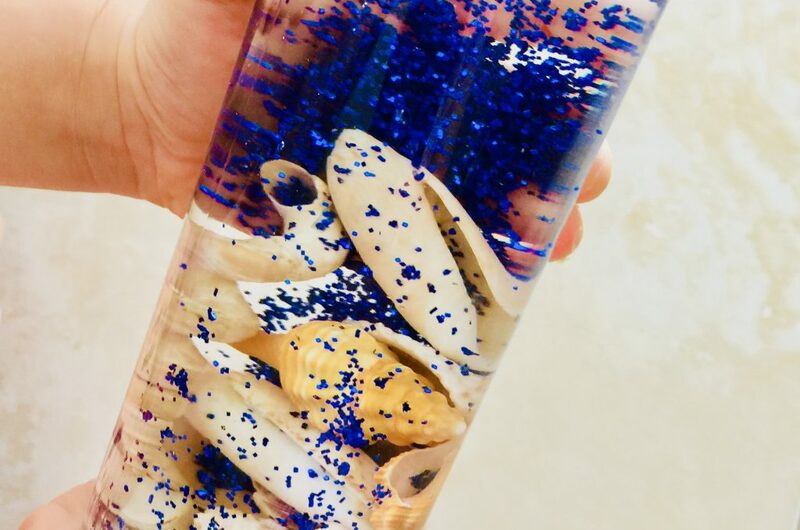 Shell and glitter sensory bottles take less than five minutes to assemble! First add the shells to your bottle. You want to make sure that you have enough shells for the bottle to be fun, but not so many that they can’t move in the bottle freely. We added about 15 different shells to our bottle. And be sure to use a variety of shell shapes and colors! We used long shells, round shells, white shells, and orange colored shells. 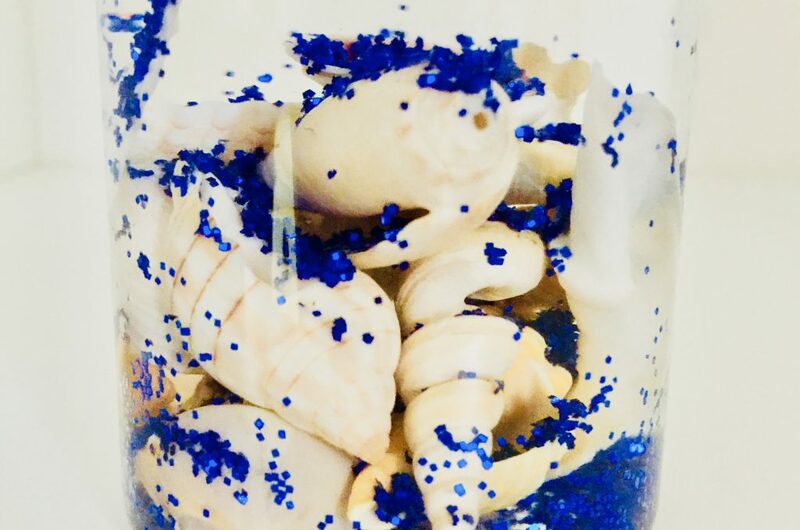 You can either use shells that you gathered yourself on a trip to the beach, or if you don’t live near the beach you can find sea shells here. We used some of the same shells that we used in our Day At The Beach Sensory Bin. You also want to make sure that your shells are small because the openings of the sensory bottles are not very big. If you want to use larger shells you will need to find a bottle with a larger opening. But you really don’t want shells that are that big anyways so that you can fit enough in the bottle and so that they can move freely. Next add the glitter to your shell and glitter sensory bottles! I added about 3/4 of a teaspoon of glitter to our bottle. But feel free to add as much as you would like. We used blue glitter, but any color will work. If you have a different color on hand, use that! The last item to add to your bottle is water. Simply fill the bottle up with water and screw on the lid. And now your shell and glitter sensory bottle is complete! And isn’t it so pretty? Like I mentioned above, the feel of the shells and water sloshing through the bottle is very therapeutic. For me it has the same effect as a stress relief ball! Even my oldest son really liked this one! He has a mild case of Tourette’s Syndrome and sensory toys and items are really beneficial for him. You can read more about that in my post 10 Must-Have Sensory Toys For Kids! 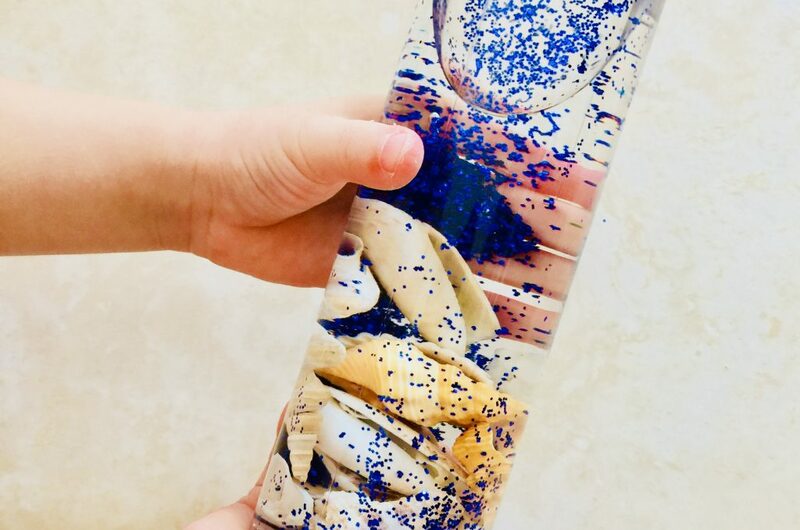 I hope you and your child enjoy the shell and glitter sensory bottle as much as we do! « Perler Bead Ideas – Perler Bead Magnets!